Hard-anodised aluminium gives the best combination of durability, light weight, and heat transfer. The only real flaws I see in this product are that the handle is relatively heavy, at 36 g (1.3 oz), and the lid could fit tighter. 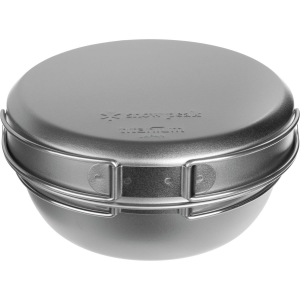 The only hard-anodised aluminium pot on the market with an actual lid. I have the 1.1L Halulite Boiler, which is a supposedly proprietary aluminium alloy. It's hard-anodised with NO non-stick coating. 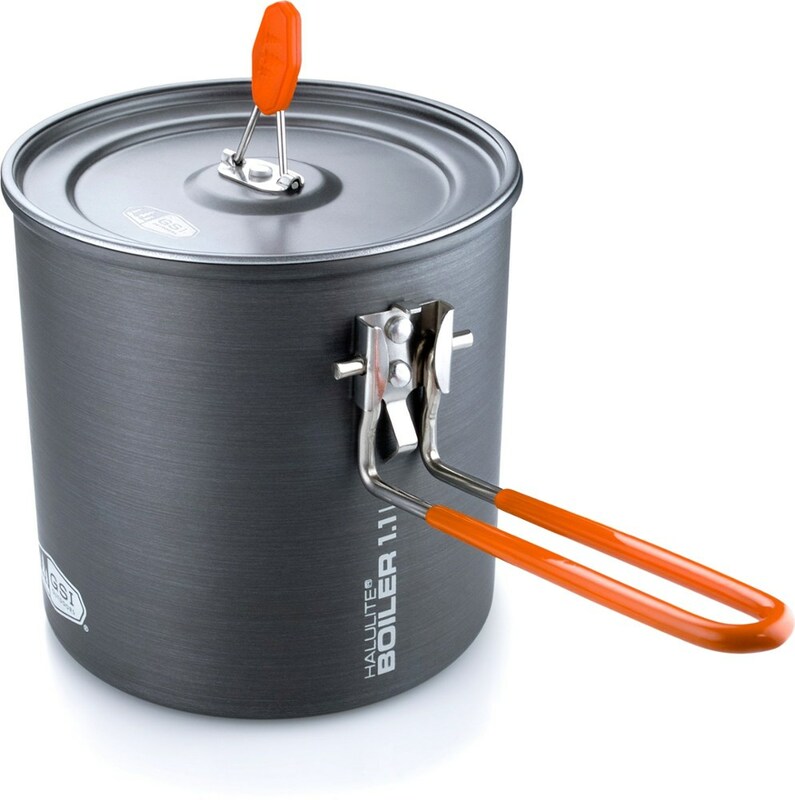 So far as I am aware, it is the only hard-anodised aluminium, uncoated pot on the market with a proper lid. 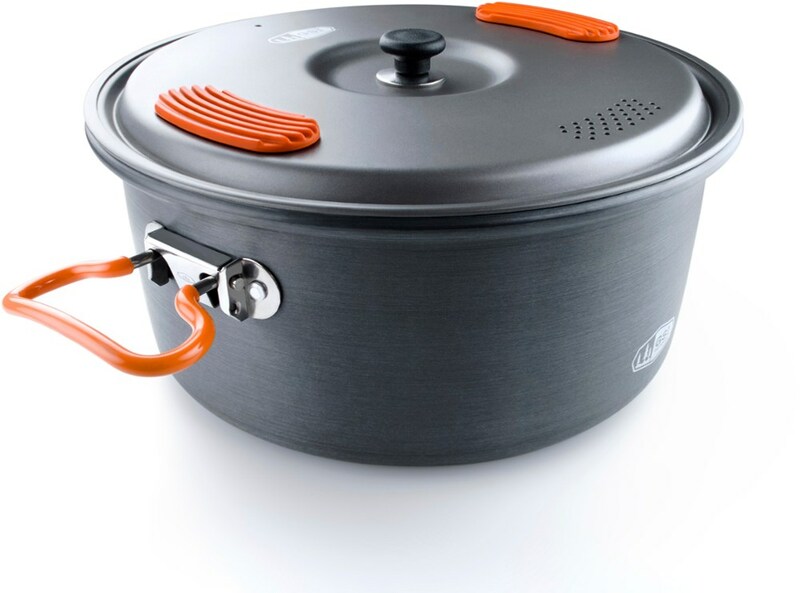 The lid in question sits atop the top rather than in the pot, like on traditional cookware, but it works well. My only quibble with this pot is that the handle seems to be steel with a polymer coating. While it's well-designed otherwise, if they had made it from aluminium, as well, it would have been substantially lighter. That being said, the handle is easy to remove, and you can use traditional pot lifters with it. 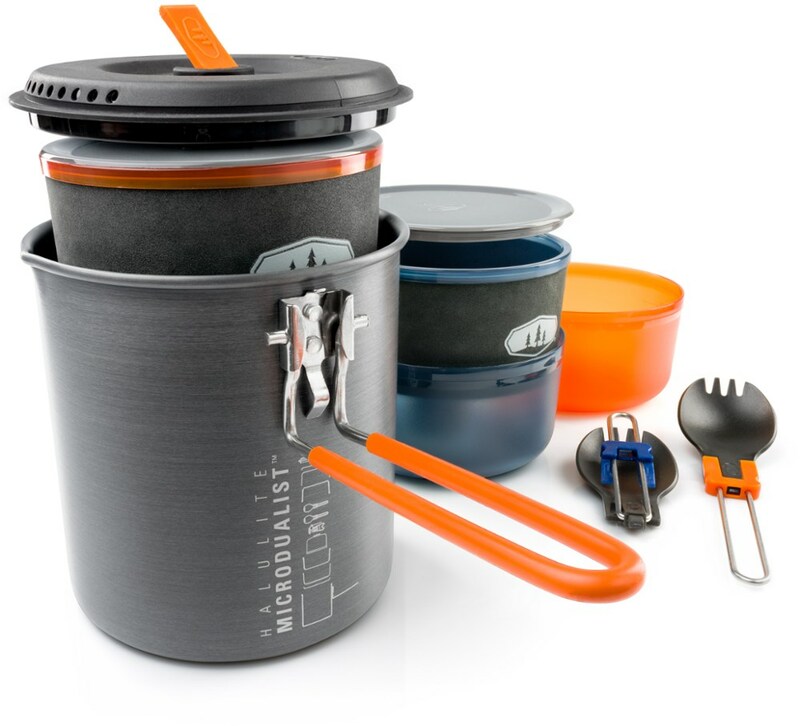 I have spoken to GSI Outdoors, and they inform me that the lid also fits the 1.4L Halulite pot that comes as part of the Halulite Microdualist cookset, which has a plastic lid. GSI will sell you the lid alone, if you call them and ask for one (as per GSI Outdoors customer service inquiry I made). The pot is *just* large enough to fit a 220g gas canister with a paper towel or piece of cloth or two to ensure the finish doesn't get scratched. 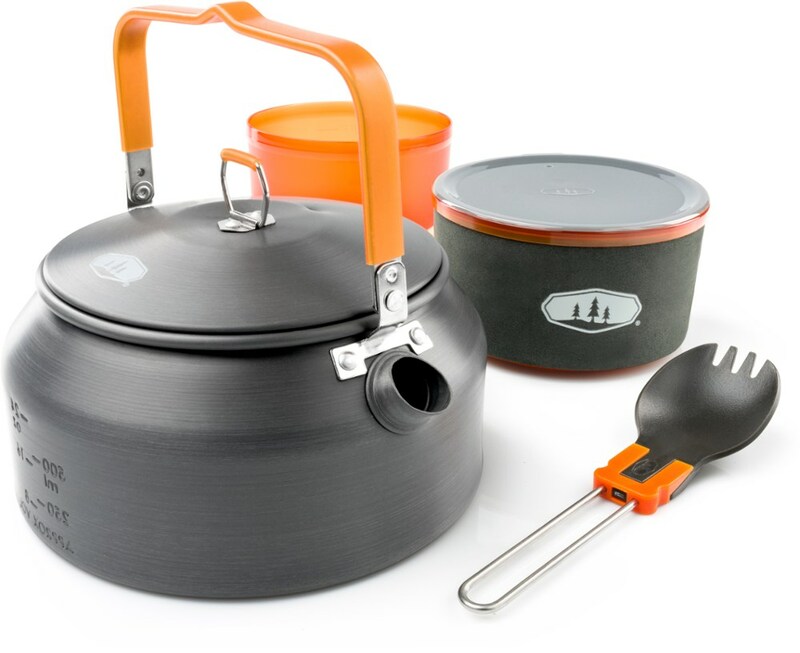 It's probably large enough to fit a microburner stove, too, if you like to store your stove inside your pots. The total weight of the pot as measured by me is 212 grams, with the handle alone coming in at 36 grams. 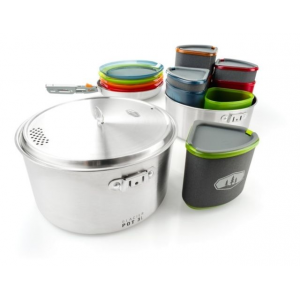 Altogether, with two paper towels, new gas can, and mesh stuff sack (included), it comes to 602 g.
While this pot may not be the right fit for an ultralight fanatic, for less stringent users, I can't imagine a better pot for boiling water. I don't cook food in mine, though I may get a second one for that. The shape of the pot is good for microburners, and balances well on my MSR Rapidfire or PocketRocket. Being aluminium, it heats and cools quickly. I think the heat transfer advantages of aluminium over titanium are worth the extra weight. 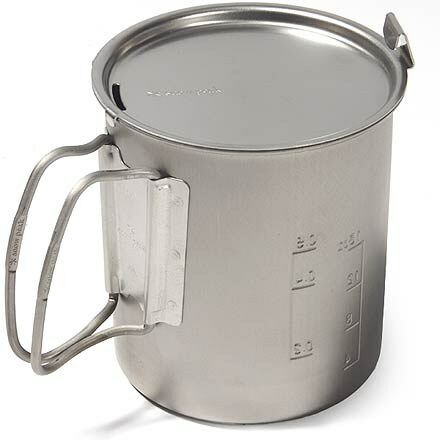 Compare to the MSR Titan Kettle (850 mL) at 118 g, Snow Peak Trek 900 Ti (900 mL) at 175 g, or Evernew Ti Ultralight Pot (1300mL) at 130 g, all of which sell for about double the price of this pot. Welcome to Trailspace, Gemma! Thanks for sharing your first reviews with us.